Why the interest in stratification? A colleague, Simon Western, referred me recently to Actor-Network Theory and the work of Bruno Latour in the context of a conversation about the behaviour of health care networks. I commented that I thought standardisation per se was insufficient in understanding what made networks effective, the issue being to understand their stratification. Thus standardisation operated within some of the strata of a stratification and then in different ways depending on the nature of the relationship to demand that the network as a whole was mobilising. So here we were with what looked like a disagreement – follow the networks of interactions and the worlds they construct versus how are the worlds of networks built? In what follows, I explore the ways in which there is no disagreement between these positions. In relation to what does a network form? A useful place to start here is the social object. An example of a social object would be the condition of a patient, but the condition encountered as an event – some singular moment in which there is something about the condition that disrupts existing understandings and/or irrupts in a way that insistes on being attended to . A social object represents a particular affective relation to a situation in which some aspect of the situation itself is experienced as complex, question-generating, endlessly unfolding and incomplete. The social object is to be distinguished from a ‘real’ object, being like a flag around which people may gather allied in relation to the situation that the flag signifies. Its efficacy in serving as a social object depended on there being a fit between the nature of its incompleteness and the individuals’ own experience of lack – an identification between some aspect of an individuals’ unconscious lack and the imaginary form given to it by the social object. This ‘gathering around’ takes the form of a network of interactions that includes not only people as actants, but tools, technologies, ways-of-thinking and anything else that enables a current state of affairs to be modified by the differences it makes in the interactions. In the case of our patient, it is hopefully a gathering around the cause of addressing his or her condition. the way scientific and technical work is made invisible by its own success. When a machine runs efficiently, when a matter of fact is settled, one need focus only on its inputs and outputs and not on its internal complexity. Thus, paradoxically, the more science and technology succeed, the more opaque and obscure they become. The definition of these black boxes ‘punctualise’ the actants between which interactions are taking place, and when there is some breakdown in the interactions, such black boxes are ‘depunctualised’ in the sense of being opened up themselves as a network. It is this relationship of embeddedness of networks as elements of networks that is described as a ‘stratification’. Latour further distinguished a ‘real’ object “not by virtue of being tiny and fundamental, but by virtue of having an intrinsic reality that is not reducible to its sub-components or exhausted by its functional effects on other things.” This is consistent with a view of all objects and systems as forms of novel emergence, even though it is convenient for many of such objects to be considered ‘objective’ in the sense of their existence being inter-subjectively agreed as independent of the observer . So now we have networks, each one formed by interacting actants allied by a relation to a social object the relation to which operates as the (final) cause of the network. Such networks are stratified by the ways in which they are constituted in relation to embedded networks that are ignored so long as the network as a whole performs as expected in relation to its cause. How are the worlds of networks built? The ambiguity in this heading is intended. We are interested both in finding ways of describing the way networks are punctualised into strata, and also interested in how new forms of punctualisation become possible in pursuit of new kinds of effect. Latour identified a second type of ‘intentional’ object that “has no interior of its own, but exists purely on the interior of some other object”. The descriptions of interacting actants from which stratified networks are constructed have this intentional nature. Looked at like this, it is possible to see why Simon was concerned. In terms of the following diagram, by seeking to identify the ways in which structures might shape the ways in which actants interacted with each other, we would also be creating new understanding of the actants within the network itself. How so? Such structure structures an actant’s way of understanding his or her interactions with the network. The actant is subject to this structuring, over-determining the way that they attribute ontic status to their constructions. Using this approach, three kinds of depunctualisation can be articulated in the ways in which these structuring structures structure the way actants’ constructions are made. These depunctualisations are particular to the actant’s subjection to the structuring structure that they embody. The first asymmetry, separating a product/service from the technology embedded in it. The second asymmetry, separating a solution delivered to a customer from the business organisation embedded in its processes of delivery. The third asymmetry, separating the customer’s experience of the solution within their context-of-use from the customer’s demand. Why should we not want to think about the ways in which networking is made impossible by the ways in which it is not possible to punctualise? The engineer in me wants to find ways of overcoming such impossibilities. But my colleague is right in pointing out that what always comes first must be the desire motivating the formation of the network. Standardisation can be applied both to the way supply is coordinated and also to the way demand is defined in relation to the client/customer’s context-of-use. These two forms of standardisation have to be managed over a governance cycle. The examples of Ryan Air, McDonalds, Twitter and Facebook belong to particualr parts of that cycle in which there is competition on ‘customisation’ and/or ‘cost’. ‘Event’ is being used here “the problem of irregularity and indetermination, of the unforeseen and the unforseeable, of the eventually subversive and the disruptive.” See Parker, I. and D. Pavon-Cuellar (2014). Lacan, Discourse, Event: New Psychoanalytic Approaches to Textual Indeterminacy. New York, Routledge. This understanding of a social object is written about more fully in The social object – distinguishing Kleinian, ‘real’ and Lacanian objects. In explaining the basis of these social objects, Karin argued that the ‘real’ object came to serve as a social object to the extent that it supported a being-in-relation, mutuality or reciprocity between individuals on the basis of enabling temporal synchronisation or on the basis of establishing a shared temporal immediacy – individuals able to collaborate around a shared task, or individuals able to be present to each other in some situation (in contrast to the more familiar spatial synchronisation and immediacy of a face-to-face meeting). Furthermore, to the extent that this mutuality was experienced, it was experienced as a ‘We’-ness embedding the individual in a larger context, but derived from the nature of the shared situation rather than from an institutional affiliation. This understanding of the relation to ‘lack’ is developed further in a conversation on the refusal of (symbolic) castration. It is to be understood not in the sense of something unconsciously known but not yet brought to consciousness (an interpretive unconscious), but as something radically unknowable in relation to the unconscious per se – a real unconscious (in the sense of the Lacanian Real, not in the sense of ‘real’ reality). See Soler, C. (2014). Lacan – The Unconscious Reinvented. London, Karnac. Taken from Bruno Latour (1999) Pandora’s hope: essays on the reality of science studies. Cambridge, MA. Harvard University Press. Quoted from Harman, G. (2009). Prince of Networks: Bruno Latour and Metaphysics (Anamnesis). Melbourne, re.press. This is teh definition of novel emergence. See later posting distinguishing novel emergence from hierarchy. This leads to an understanding of embedded strata of novel emergence as an effect of the interest and capabilities of the observer rather than an inherent property of that-which-is-observed. See Ryan, A. (September 2006). 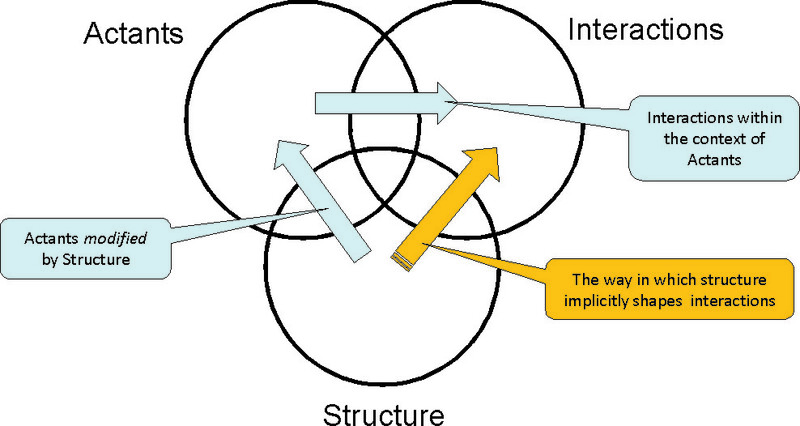 “Emergence is coupled to scope, not level.” Complexity – Complex Systems Engineering 13(2): 67-77. See the following series of postings. The ‘intentional’ nature of these objects may be understood as themselves networks that, in addition to their synchronic characteristics as a network, also have diachronic characteristics to do with the tempo at which they exhibit their behaviours, corresponding to a timespan of discretion. See Timespan of discretion and the double alignment of ‘know-how’. For more on the significance of tempo, see  below. Category theory is one medium in which the relationships between these actants may be thought about. See A Categorial expression of Demand Asymmetry. The Oxford English Dictonary defined ‘ontic’ as follows: “Of or pertaining to knowledge of the existence or structure of being in a given entity.” Thus any ‘realist’ assertion of ontology is mediated by the ontic assumptions being made by the observer-entity making the assertion i.e. an ontology is built by an entity making ontic assumptions. The 4-quadrant model gives us a way of thinking about what kind of ontic assumptions the entity is making. The concept of the strategy ceiling further elaborates on the way these ontic assumptions are held by an entity in the form of stratified relations between the enterprise and demand. For more on these layers see 3 Asymmetries. These behaviors relate to each other in the form of a stratification of nested contexts which places the supply-side behaviors of the enterprise in relation to the demand-side contexts with which it interacts. Where such a relationship does not exist, we may say that the strategy ceiling of the enterprise prevents it. See The strategy ceiling. East-West dominance means having a business agile enough to support the particular relationships of embeddedness needed to sustain a relationship to the distinct forms of demand arising at its edges. Under these conditions, the 6-layer stratification is no longer usefully thought of as a hierarchy, but rather as a particular structuring of the alignment between supply and demand. Note that it is only by including the third asymmetry that the stratification can no longer be thought of as hierarchy. See When is a stratification not a universal hierarchy? Such networks involve distributed collaboration in a complex system-of-system multi-enterprise context over which there is no single source of control. See Enterprise Architecture for Complex System-of-Systems Contexts. The tempo at which an enterprise creates new uses for its systems is different from that of its acquisition or systems development processes. For example, the military continues to confront the issue of how fielded systems can support the agility needed by its deployed forces. This problem of diverging tempos applies to a variety of large-scale, software-reliant enterprises-such as those found in healthcare and digital communications. See Building Organizational Agility into Large-Scale Software-Reliant Environments. Previous PostDefences against innovation: the conservation of vaguenessNext PostThe Governance of Specialist Care: a question of ethics?